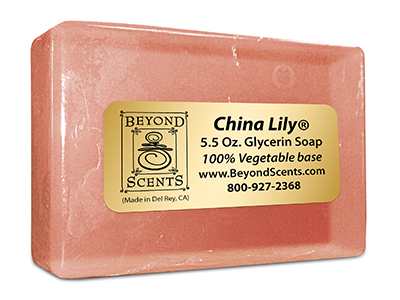 China Lily® is one of our most popular fragrances, pleasing the senses of the contemporary woman since the 1970s. Custom blend it with rich moisturizers, hydrating lotions and soothing, alcohol-free oils to revive, replenish and protect your skin, leaving behind refreshing notes of your favorite essence. Add it to our revitalizing body mist and enjoy the wonderful fragrance après shower – or yoga class – and all day long, or, delight in the classic perfume, available in 6 convenient sizes. Each order is custom-created so the combinations are endless! We make it easy for you to personalize an array of bath and body care products with this soft, sumptuous, long lasting fragrance. Peaceful and mild, this signature scent is a clean and soft feminine floral based on Lily of the Valley. Top notes of fresh air, muguet and silky musk give heart to the delicate jasmine and spice to the hyacinth. Refresh, relax, and rejuvenate as you shampoo, moisturize, wash, massage, and tone your skin with an array of spa-quality customized products infused with China Lily®. Select your China Lily® Products and Perfumes below. 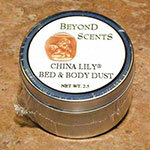 We purchase our China Lily® perfume oil directly from the original creator. China Lily® is a registered trademark jointly owned by A.K.A. Saunders, Inc., 2700 Rydin Road, Unit D, Richmond, CA 94804 and Body Time®, 707B Heinz Ave, Berkeley, CA, 94710.